Gil Scott-Heron was a poet, author, composer and recording artist. His spoken word over driving beats — humor-laced, sharp critiques of politics, racism and mass media — made him a global voice of protest for decades. The stunning memoir of Grammy Lifetime Achievement Award winner Gil Scott-Heron, The Last Holiday has been praised for bringing back to life one of the most important voices of the last fifty years. See notice of events and announcements from the Scott-Heron Estate. Thank you for visiting gilscottherononline.com. 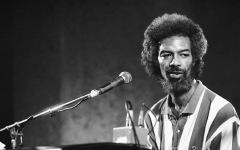 We have recently updated this official website that pays tribute to Gil Scott-Heron, one of the most influential writers and musicians of our time. Please browse this page for information on how Gil’s music is being used in movies, documentaries, advertisements and more as we continue to promote and protect his legacy. You can also select icons to see recent postings that acknowledge the timelessness of Gil’s words, hear his voice, and share your thoughts with us. We value each one of you and the role you play in keeping Gil’s legacy alive. If you take steps to promote justice and peace in the world, you also will be honoring Gil’s life. Thank you. If you wish to license Gil’s music, make use of portions of his books, or involve us in any tributes, etc., please use the contact icon to reach me. 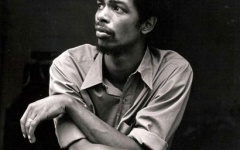 Gil Scott-Heron was born on April 1, 1949 in Chicago, Illinois, to Gil and Bobbie Heron. As he explains in his memoir, The Last Holiday, and on his last album, “I’m New Here,” his parents divorced early in his life. When he was 18 months old, he was “moved in” with his grandmother, Lily Scott, in Jackson, TN. In countless interviews and written material, Gil talks of his deep love for Lily Scott, with whom he lived until her death in 1961, when Gil was 12 years old. Gil’s mother, Bobbie, returned to her mother’s house in Jackson and took a job at nearby Lane College. And, together, she and Gil agreed that he would be among the students integrating the all-white junior high school in Jackson. A year later, they moved to New York City – a place Gil returned to as home, along with Washington, DC, where he began his career, for the rest of his life. When he died on May 27, 2011, he had achieved an eclectic fan base that spanned the globe, and had published two novels and several books of poetry. 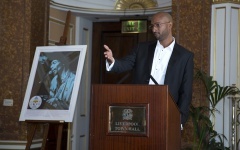 He also had completed his memoir, which was released by his publisher posthumously in January 2012. In February 2012, Gil received a Grammy Lifetime Achievement Award, which was accepted by his four children: son, Rumal Rackley, and daughters Nia Kelly, Gia Scott-Heron, and Chegianna Newton. Two years later, he was inducted into the Grammy Hall of Fame for The Revolution Will Not Be Televised. Gil was predeceased by his parents. His mother, Bobbie, died in 1999. Gil met his father when Gil was 26 years old, he says in his song “Hello Sunday, Hello Road.” At the same time, he met his siblings, Gail, Denis and Kenny. Kenny died in 2000, Gil Heron Sr. died in 2008, and Denis died at the end of 2014. Sampled by the world’s leading artists, his legacy and influence transcends generations. For several generations, Gil’s work has and continues to influence popular culture and media. My pops would have turned 70 this 2019 year on Earth, and even though he’s now with us in spirit only, his April 1st birthday still deserves a celebration. Thanks to all who are paying tribute. If only we could get his take on what’s going on now in Washington, D.C.! No one can synthesize it like he could. We miss you. Miss your humor and insight. Miss your dedication to the quest for justice and peace. Happy 70th birthday, Gil Scott-Heron. 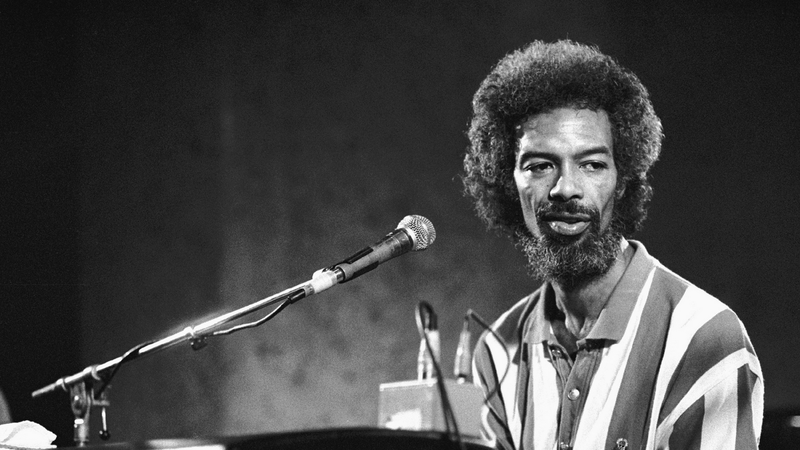 Gil Scott-Heron selected for the National Recording Registry. This classic example of street poetry, which foreshadowed the politically charged rap that would emerge more than a decade later, first appeared on Scott-Heron’s 1970 debut album, Small Talk at 125th and Lenox. Scott-Heron recorded the piece again, with a full band, for his 1971 album Pieces of a Man. Selected for the 2005 registry. Gil was inspirational to my cousin Jodie as you will see in this link. Hello and Happy New Year! 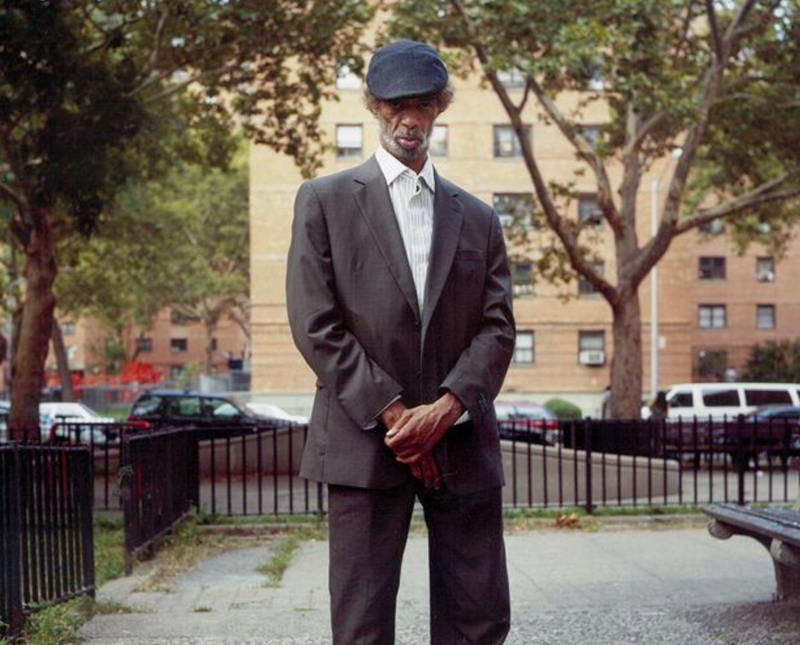 I am pleased to open the year with the news that Gil Scott-Heron is among eight well-known achievers showcased in a dramatic work of art“Beacons” that graces a Bronx subway station wall (167 Street stop). The work was quietly unveiled on the evening of Wednesday, Jan. 9th 2019. Congratulations to Rico Gatson for this concept. From a mention of Gil’s name in the season finale of “Queen Sugar” in August 2018 to a mention of his name and use of “Your Daddy Loves You” in the recent “S.W.A.T.” episode 118 on CBS, visibility continues to grow steadily. Keep an ear out for “Whitey on the Moon” in the movie “First Man,” in theaters soon; and “Home Is Where the Hatred Is” in the FX acclaimed show “Snowfall,” in the episode airing on Sept. 20, 2018. Visit this site often for updates in the months ahead. 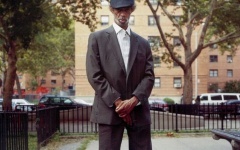 It’s been seven years now since Gil Scott-Heron died on May 27, 2011. Still, a lot of grief remains but the overriding feeling is one of gratitude that he loved us and left the world with a treasure-trove of insightful commentary through music and literature. My promise to him – then and now — is to do all I can to protect and promote his legacy so that his brilliance may never be forgotten. I want to work with people who cared about him to carry on his mission to make the world a more just and loving place – and to take the best of him with us on our journey. So many people in the entertainment industry have recognized the power of Gil’s artistic work and incorporated it in their story telling, delighting their audiences and extending his legacy for generations to come. Others who dedicate themselves to the quest for equal rights view him as an icon and promote his messages to their audiences through print and broadcast, and live events. Thank you, all. 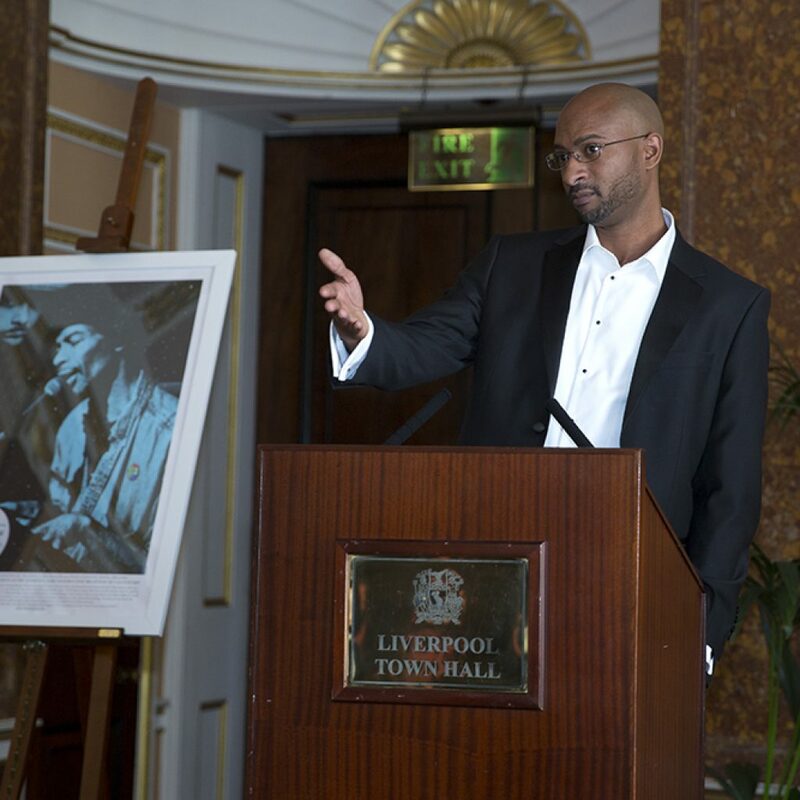 Please get in touch with me if you want to be engaged with promoting and protecting the legacy of Gil Scott-Heron — a true genius who did his best to learn, to teach, to agitate and advocate for equality, to entertain, to make people laugh, and to love people wherever he went around the world. I am happy to share with you a trailer that uses Gil’s “The Revolution Will Not Be Televised” to promote Marvel’s upcoming “Black Panther” movie​. I feel certain that Gil would appreciate the symbolism inherent in this use; and the song’s inclusion will introduce Gil’s voice to an entirely new audience. “I have never seen anything like this,” says shadowy government agent Everett Ross (Martin Freeman) at the start of the official Black Panther trailer — and to judge from the trailer footage, Marvel’s next solo superhero movie delivers on that promise. Yet, there was great symbolism in Gil being born on April 1 – a time many people devote to humor. From childhood, Gil showed a clever, quick mind that he applied to entertaining his grandmother who raised him and to writing stories in his ever-present notebook. In his late teens and for the rest of his life, Gil’s creativity, laced with a powerful wit, resulted in profound poetry and prose that could sting and amuse simultaneously – words that have stood the test of time, as relevant now as they were when he wrote them. For us April 1, 2017, is Gil Scott-Heron’s birthday before it’s anything else. We celebrate his caring spirit, amazing sense of humor, depth of understanding of the human condition, and commitment to inspiring activism to make the world a better place. Gil transitioned to the spirits at age 62 on May 27, 2011, but we feel him with us, always. Happy Birthday, Gil, from your loving family, friends and admirers! Gil’s “Running” is featured in a new Adidas ad campaign. ​​The 60​-second ​film (​see link below) showcases NFL cornerback Marcus Peters, MLB shortstop Carlos Correa, NBA forward Justise Winslow and WNBA guard Moriah Jefferson, and promotes alphabounce. Enjoy the link below. Adidas says: “Running” by Gil Scott-Heron, a cultural icon of individuality and disruption, mixes old with new and provides a fresh take on the sport in the campaign’s film. ​​As always, let me know if you are aware of interest in licensing Gil’s intellectual property. Thank you for your support in promoting Gil’s legacy. Gil Scott-Heron’s voice is in the opening montage of Showtime’s Homeland for the duration of Season six.